This Fords Colony Country Club wedding was the perfect way to start off our 2018 wedding season! 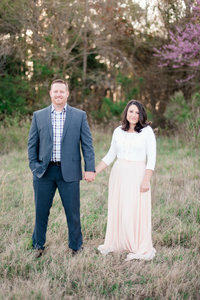 This past Sunday these two tied the knot at Fords Colony Country Club and they had the most amazing day ever. However, our story goes back a little bit further than Sunday. A couple of years ago, we offered mini sessions. Erika snagged up a spot at the Noland Trail and that is where the story begins. She brought along her sweet pup Elsa and of course Jason. I remember they were the last of the day and we spent extra time with them because we just got along so well with them. They were dating at the time and we knew that the time was coming for Jason to ask Erika the most important question and so we waited…. ever so patiently! We got the news a little while afterwards that she said yes and the wedding planning began! Their engagement session in Richmond was one to remember and after that session, I knew that they were more than clients at that point. They made it into the friend zone! Luke and I just love their personalities and who they are as individuals as well as a couple. They are fun, genuine, and energetic. Erika is so classy. Her confidence and beauty shines wherever she goes. She is genuine and has such an amazing personality. I just love being around this girl! And Jason! He definitely brings the laughs. He is kind, genuine, and thoughtful. Together these two make an incredible duo. Virginia is funny. The weather is never can make up its mind. We always hope for the best but prepare for the worst with this weather. About a few short days before their day the weather changed constantly! I remember looking at the forecast for Sunday which was their date, and it called for snow! Then rain, then partly cloudy. The day of the wedding was perfectly sunny. Hardly a cloud in the sky! It was everything these two prayed for! Spring has sprung here in Virginia but some of the trees have yet to bloom yet. We were lucky to have beautiful cherry blossom trees right outside where the girls were getting ready. It was absolute perfection! Fords Colony Country Club is such a gem of a venue. I love Fords Colony coordinator Shay. She is so responsive, caring, and ensures every couple gets excellent customer service. It is always a joy when we get to work with vendors who put all their heart into their jobs and our couples. The club is such a great place to get married. The ceremony space is intimate and inviting. The reception space is spacious and beautiful with the white drapes, hanging lights, and gorgeous window light. Fords Colony is definitely a venue we will recommend over and over again to our brides and grooms. To the new Mr. & Mrs.
Jason & Erika, you two had an amazing day. All your planning, preparation, and hard work paid off and you two have created some amazing memories to look back upon. You two were made for each other. You compliment one another perfectly and the future looks so bright for you both. Luke and I just want to tell you to hold on to this day. Each day, week, month, and year that passes remember your why. Why you chose one another. May each anniversary be filled with even more love for your spouse than the year before. Dream together and hold onto each other. We love you guys and thank you for inviting us into this beautiful story of yours! I just have to say something really quick! Photography was especially important to Erika. As a photographer herself, she knew the value of carving out time for extra pictures. Because she carved out the time we were able to get some incredible sunset pictures of the two newlyweds! I recommend to all our couples to make the time. 15 minutes to run outside before sunset and let us grab a few more of the two of you! We promise you won’t regret it! Another side note, it was FREEZING cold! Yet Erika got through it and said it was worth every goosebump! She was absolutely amazing and these are our favorites by far! Just look at all that golden yumminess! Of course we had to hit the Photo Booth with Gibby Visuals! I love how Elsa made an appearance! What a fun night! Florist: Greta Bevins & Erin Walker ( Friends of the bride). Coordinator: Lauren Jones ( Friend of the bride). In case you missed their fun engagement session you can see it here! If you want to see more weddings at Fords Colony visit these lovely couples galleries below!